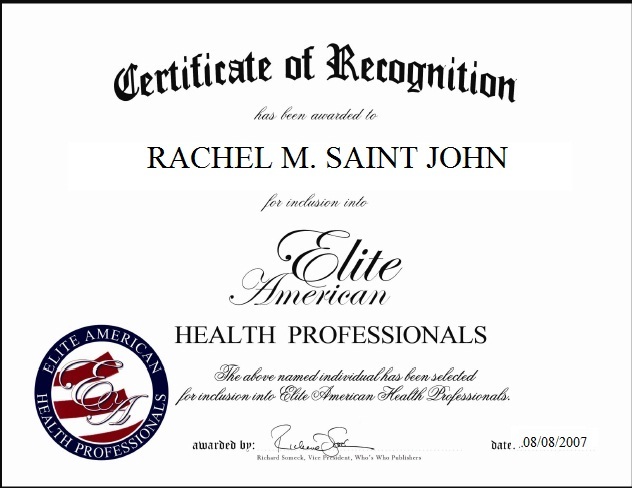 Rachel M. Saint John serves at the helm of her own health care consulting clinic which provides top quality clinical and organizational consulting solutions for individuals across the nation. With a pronounced background in mental health, psychiatry and chemical dependency, Ms. Saint John enjoys serving as a mentor to the young nurses with whom she works, and has the unique ability to work with different kinds of people at both the corporate and hospital level. She holds a Bachelor of Science in Nursing from Schott and White Memorial Hospital and Clinic, and an Executive MBA from Claremont University. She also holds a Master’s Degree in Nursing Administration and Psychiatric Nursing from the University of Texas at Austin. This entry was posted in Counseling, Health Care Administration, Health care advisory and tagged consulting, counseling, nursing services. Bookmark the permalink.